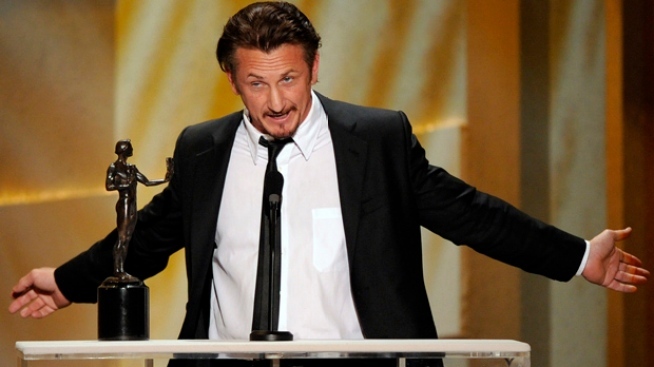 Sean Penn accepts the award for outstanding performance by a male actor in a leading role for "Milk". Meryl Streep of the Roman Catholic drama “Doubt” and Sean Penn of the Harvey Milk film biography “Milk” won lead-acting honors Sunday at the Screen Actors Guild Awards. The prize for overall cast went to the rags-to-riches saga “Slumdog Millionaire,” while Heath Ledger of Batman blockbuster “The Dark Knight” and Kate Winslet of the Holocaust-themed drama “The Reader” took supporting honors. “Can I just say there is no such thing as the best actress, there is no such thing as the greatest living actress,” said Streep, the Academy Awards record-holder with 15 acting nominations, including one for “Doubt,” in which she plays an old-school nun in a war of wills against a progressive priest. “As actors, we don’t play gay, straight. We don’t play any of these kinds (of roles). We play human beings, and this movie is something that all of us involved are so proud of,” Penn said. The award was accepted by “The Dark Knight” co-star Gary Oldman. Oscar buzz has been flying over Ledger’s performance since before his death just over a year ago from an accidental overdose of prescription drugs. With the SAG win and the Golden Globe, Ledger now looks like a virtual lock to receive the supporting-actor Oscar on Feb. 22. Winslet offered a tribute to the late Anthony Minghella and Sydney Pollack, both producers on “The Reader,” and said 2008 was a fabulous year for films. The role already earned Winslet the same prize at the Golden Globes, where she also won lead dramatic actress for “Revolutionary Road.” But at the Oscars, Winslet has just one nomination, as lead actress for “The Reader,” in which she plays a former concentration camp guard. As it did at the Golden Globes, “30 Rock” swept the TV comedy honors, Tina Fey and Alec Baldwin taking the individual acting prizes and the show winning the ensemble cast award. Fey, creator and star of the series set behind the scenes at a sketch-comedy show, lobbed a wisecrack at Hollywood producers, who have battled Hollywood trade guilds over actors, writers and others’ share of potential profits from Web programming. Hugh Laurie, who won his second straight SAG prize for best actor in a TV drama for the medical show “House,” joked that he was disappointed one of his fellow nominees did not win. Before the show, “The Dark Knight” won SAG’s honor for best movie stunt ensemble, while “Heroes” took the same prize for television. James Earl Jones was honored with the guild’s lifetime-achievement award for a career that included roles in “Dr. Strangelove,” “Field of Dreams,” “Cry, the Beloved Country” and “The Man,” in which he played the first black U.S. president. The ceremony featured clips highlighting Jones’ rumbling bass voice as the mouthpiece of “Star Wars” villain Darth Vader, the noble patriarch in “The Lion King,” even cable news with his “This is CNN” announcements.